Viewfinders are what photographers rely on to accurately compose a pictures. There are different kinds of viewfinders, and it's important to understand the pros and cons of each before buying a camera. Cameras can have an LCD screen with Live View, an optical viewfinder, an electronic viewfinder, or a combination of these. For example, many DSLRs cameras now come with LCD screens with Live View, in addition to an optical or electronic eye-level viewfinder. Many point-and-shoots only have an LCD screen. The electronic viewfinder technology has come a long way in the past few years and some DSLRs are using them instead of the more traditional optical viewfinders. Here is a look at each type of eye-level viewfinder and what they have to offer. 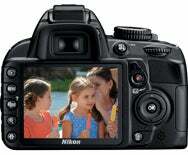 The Nikon D3100 has two viewfinders: An optical viewfinder and an LCD screen with Live View. Found on DSLR cameras, an optical viewfinder (OVF) allows a photographer to compose a shot while seeing exactly what the lens sees by looking through the lens (TTL). This optical viewfinder works by using a system of mirrors and prisms, like a periscope, to bounce the image up to the viewfinder and the eye. This is the preferred viewfinder for many pro-photographers. The optical viewfinders on point-and-shoot cameras are different in that they don't show you exactly what the lens sees; they look through a separate hole above the lens and show a slightly different view from the final image. Pros: The advantages of the OVF are that the photographer sees a scene with no time lag, no resolution limits, and with all the clarity the lens and the human eye can produce. Sports shooters rely on this system to see action immediately and anticipate the kind of timing necessary to capture the right moment. OVFs also save battery since looking through them doesn’t require any charge, and the photographer can take time to compose a shot before turning the camera on. And anyone who has tried to use an LCD screen in bright sunlight can appreciate that eye-level viewfinders aren’t affected by reflections. The Canon G12 has an optical viewfinder, which sees through the hole above the lens. Cons: Optical viewfinders usually show a smaller portion of a frame than what the final image will actually include, and they can feel a bit like looking through a tunnel. Camera manufacturers will list the percentage of the frame a viewfinder covers in a product's specs. For example, the Nikon D3100's viewfinder shows 95% of what the sensor captures. The OVFs on entry-level cameras (sub $1,000) can be a bit dimmer than the ones found on high-end models. Also, all autofocus cameras can be a challenge to focus manually while looking through an OVF. A final downside of an optical viewfinder is that the mechanisms required to make it work take up space. In the quest for smaller, lighter camera bodies, OVFs are being replaced with their less-bulky digital equivalent, the electronic viewfinder. The electronic viewfinder (EVF) has seen a renaissance in cameras over the past two years, with the release of new compact interchangeable-lens cameras with live view. Camera manufacturers are presenting EVFs as a serious alternative to the optical viewfinders that are in many high end DSLRs. But what differences remain? Remove parts like the mirror, prism, or old style Phase Detect autofocus system, and a camera’s body can be made much more compact. Those parts are replaced by a video feed from the sensor that is displayed on either a screen on the back of the camera, or on a screen inside a viewfinder—the electronic viewfinder. The high end EVFs found in Micro Four-Thirds, Samsung NX, and Sony SLT cameras aim for a more pleasurable shooting experience by overlaying helpful settings and guides on the EVF screen. The Samsung NX100 has an electronic viewfinder that attaches to the hot shoe mount on top of the camera. Pros: The view the eye sees through an electronic viewfinder is huge. Because it is video, it can be made to fill the field of view, which feels more expansive compared to the tunnel-like experience in sub-$1000 DSLR cameras. For example, the optional EVF for Olympus' E-P2 camera shows 100% of what the sensor will capture. Many people find that focusing manually using an EVF is easier than with an OVF because the EVF allows you to magnify an area to clearly see when the subject snaps into sharp focus. EVF screens also brighten automatically, making it easier to see a scene in low-light situations, or preview at smaller apertures. The EVF can also show much more information than an OVF. Besides exposure numbers, an EVF can show a live histogram map of the dark-to-light tones in the image. It can show a live preview of white balance settings and simulate shutter speed, among many things. It’s not just what you see through the viewfinder that’s different. Using an EVF can also change the physical shape of a camera. Remove the need for mirrors, and the camera can be made much smaller, even open the possibility for entirely new shapes and ergonomics. And by removing the mirror, it’s easier, physically, to increase the shots taken per second. Cons: Even with all the bells and whistles, the latest and greatest EVFs are often not good enough for many photographers. Though improved drastically over old versions, the refresh rate of an electric viewfinder still lags a little. For example, trying to catch a diver as he or she touches the water might actually result in a picture of legs sticking out of the water. You can miss a baseball batter's swing, or the moment a tennis player's racket hits the ball. Even high-resolution video cannot match the human eye for seeing detail in shadow and bright areas at the same time, picking out fine details, and instant responsiveness — all of which are crucial for studio, sport, and fully manual photography. An EVF can also look jerky and noisy in very low light. Probably the biggest issue with EVFs is their effect on battery life. The camera must be turned on and burning battery juice for an EVF to be used. Currently, interchangeable lens EVF cameras can only last between 270 and 400 images. Electronic viewfinders offer far more features than the optical variety, but do they win out in function? User preference is definitely a key factor in making a viewfinder decision—do you prefer to look at subjects through a periscope or a television? The increased flexibility and usability experience of a large, detailed EVF may just suit most situations better in the sub-$1000 category of cameras. However, a streamed video feed may never be clear or responsive enough, or accurately show enough dynamic range for some photographers. Updated at 9:24 PT to clarify terminology.